Now that we have a sort of routine going, every Saturday morning, I will leave Loïc with his papa and spend some one to one time with Laetitia. We would usually take the public transport, especially the bus as she loves to go on the bus, to somewhere together. 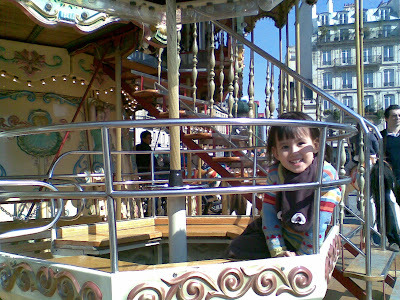 Last Saturday we went to Hôtel de ville where there is a huge merry-go-round and we went on it together. After that, we had a little break in MacDonalds before going to a outdoor market and finally headed home for lunch. It is really nice being able to spend some time individually with her since I have Loïc with me all the time. On the merry-go-round by herself. She went on it twice by herself and once with me. 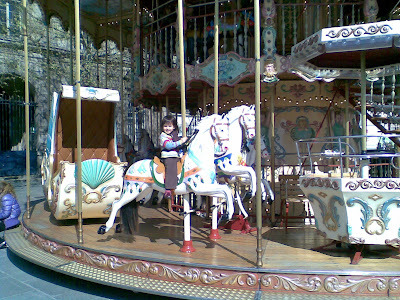 It's really expensive this particular merry-go-round, 2,70€ each ride. 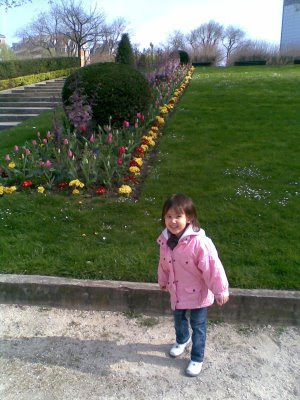 And the week before, we went to a little park. What a great idea to spend 1 on 1 time with Lae. I must do that with B. too when baby comes along. Yes, definitely do it. I think it is so important for the older child to know that they are still important and they can continue to have daddy or mummy's individual attention.